This is the fourth adventure for this delightful little girl. 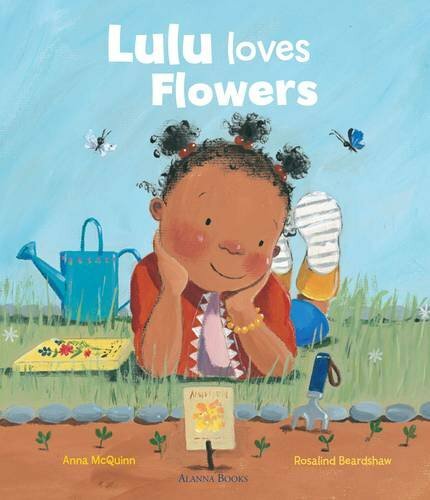 Previously, Lulu’s books have seen her indoors – Lulu Loves the Library, Lulu Loves Stories and Lulu Reads to Zeki – but here she’s outside too, inspired by her favourite nursery rhyme Mary, Mary, to grow a flower garden. Lulu finds helpful books in the library, makes a list of what to buy with Mum, buys the seeds, plants them, and then waits for them to grow. The waiting isn’t easy for this bouncy little girl, but she finds lots to fill her time. When the flowers bloom, Lulu celebrates with a party for her friends. From the opening spread which shows Lulu sharing a book of garden poems with her mum, the book exudes warmth. Anna McQuinn’s stories of Lulu are authentic, and totally in tune with young children’s lives – the interior as well as the external – and Rosalind Beardshaw’s expressive illustrations complement the text perfectly. We see how happy Lulu is working in her garden, and how much fun she has making decorations for her garden and even a little Mary Mary puppet. Later she will invent stories for the little Mary Mary and act them out with her friends: in fact the book provides a wonderful source of ideas for indoor and outdoor activities for pre-school children. What will Lulu think of next asks the final spread – we can’t wait to find out! A wonderful book to share.